The pair did break below the rising trendline and after a broad based US Dollar rally the pair is now trading around 1.4100. Needless to say, I don’t think the pair will retest my entry point, so it’s time to close my entry orders. No trade. I’m a bit mad at myself for not putting up two orders, but it’s a lesson hopefully learned and I may have to make adjustments in the future. Until then, let’s see if this sharp EURUSD drop will stall and pull back or continue lower from here. Hard to tell with more data coming out for the rest of the week, so it’s all about staying alert and acting fast. Stay on your toes and stay tuned! Good afternoon! As I’ve still got my USDJPY trade marinating on the side, I see a technical setup on EURUSD forming for a shorter term play. Check it out! Technically, I actually see two setups on EURUSD. 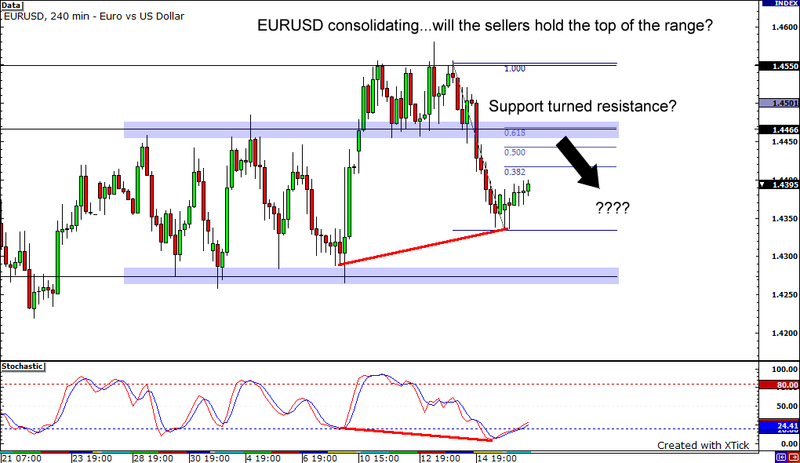 First, from the chart above we can see EURUSD has been range bound for a few weeks. That support around 1.4450 was recently broken and now may be an area of resistance. I also see a hidden bullish divergence signaling that the pair may continue to rise from these levels and test that broken support. If it does, will the range hold? The second setup is a simple short below that red trendline on the price chart. The pair is forming a bearish flag on the daily time frame, so a short below that trendline makes sense. For now, I will focus on the retracement higher. Fundamentally, the focus for this pair (besides the economic growth and massive, growing US debt) is the current imbalances in the European Union. The ECB is now facing the problem of some countries are beginning to get back on their feet, while others are getting worse and sliding into deflation. What will the ECB do with interest rates then? Again, I’m no Nostradamus so I can’t tell you what will happen, but I think if the “great experiment” that is the European Monetary Union falls apart traders will drop the Euro like it’s hot! Lots of data to move markets this week, so hopefully there will be enough volatility to take me to profit land! Stay tuned! A quick comment on the disaster in Haiti. I’m sure a lot of you have already done or looked into this already, but if you haven’t then I just wanted to encourage you to see if you can help support Haiti during their time of need. I’m sure that a lot of support is already coming through for them, but from what we are all seeing and hearing, it is going to take as many people as possible just give them a chance for survival. I know that these are rough times for many in the aftermath of the global financial crisis, but even if it’s $10, it’ll go a long way if we all do it–and it’s as simple as sending a text. Lets do what we can to save a few bucks this week so we can give and hopefully save lives.